We don’t normally snorkel on dive trips, mainly because we’re too tired from the diving and packing up the gear at the end of a trip that it’s not always worth our while. Unsurprisingly, Wakatobi was different. 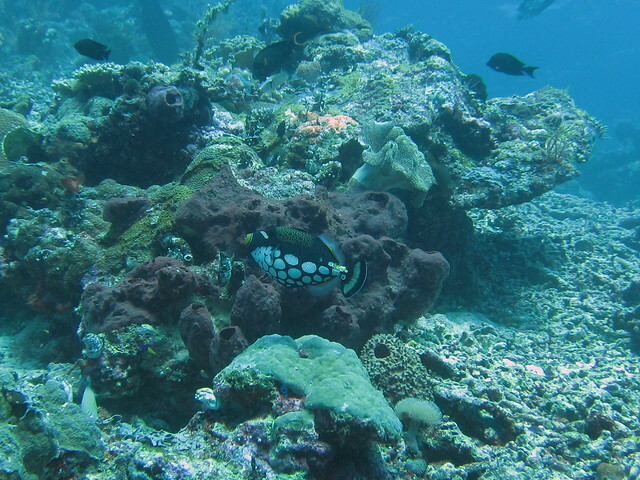 The house reef is really quite something, especially when just standing at the jetty you can see plenty of life. We saw crabs and even an octopus one day. Too bad we couldn’t get to the camera in time. 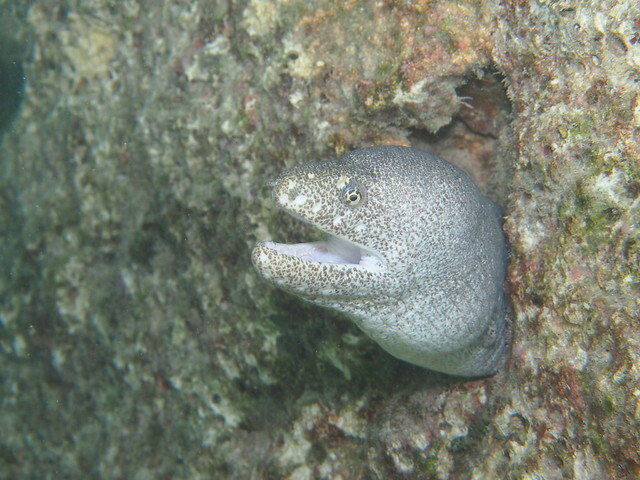 This peppered moray eel, on the other hand, came out often enough for us to get a good shot! Imagine what the snorkelling is like if it’s like this just from the jetty! Snorkelling was much less cumbersome than diving. We simply walked into the water from the beach in our booties, with mask, snorkel and fins in hand. When it got deep enough, we slipped on the fins and mask then kicked off. 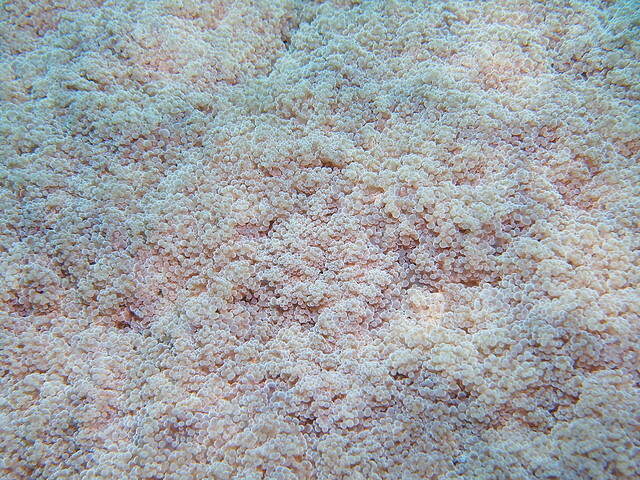 The house reef was full of coral just a few metres away from the sandy beach area. 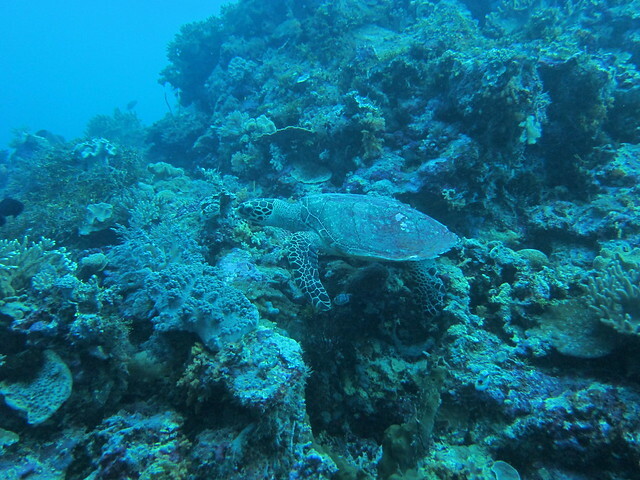 Unsurprisingly, it wasn’t much different-looking in landscape than when diving. It was wonderful to see the deep blue of the water even so close to shore. 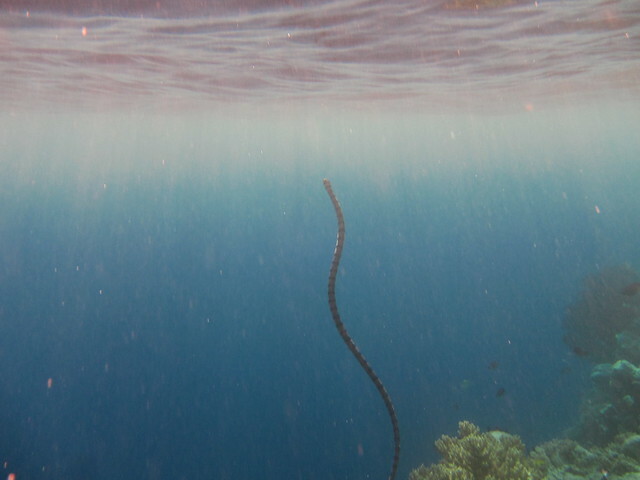 What was more astounding was the sighting of a banded sea snake so close to shore. I always thought they were too shy to go close to shore. Maybe it was desperate for air because it shot straight up to the surface. Luckily I managed to take a quick snap before it disappeared. 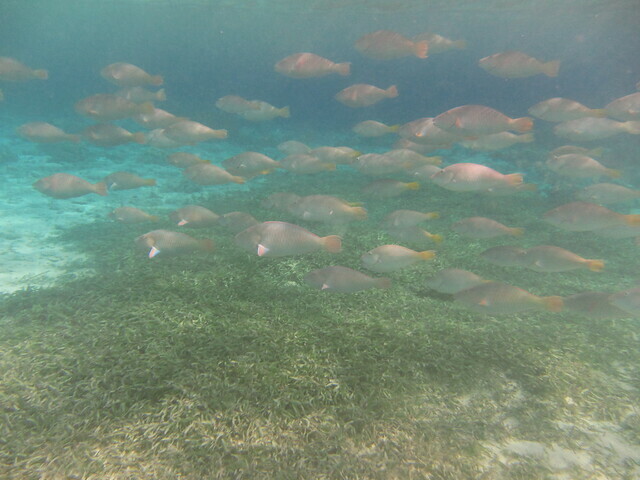 It is much harder to take photos while snorkelling. Even though we weren’t in our wetsuits, it was tough to stay down. Some people snorkel with weights, even. Photos have to be taken quickly and accurately, like how DC got this shot of a honeycomb grouper. 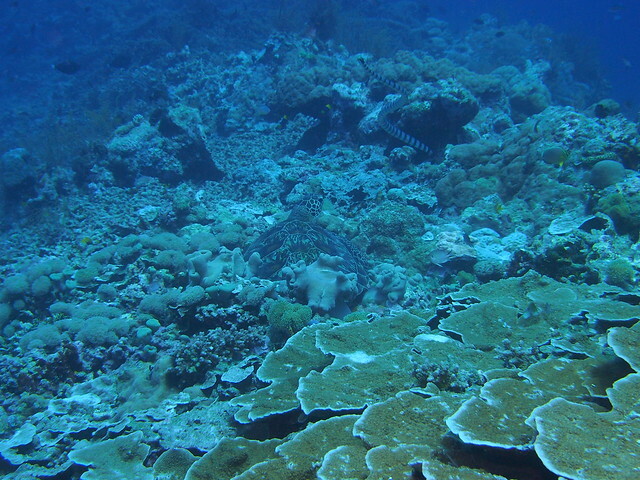 Either that or you’ll end up with strange compositions, like this with the same group partially hidden in the coral rubble. 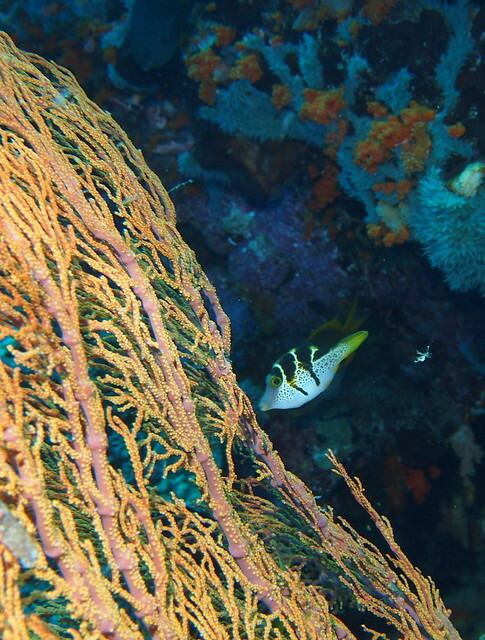 I was also surprised to see species that I’d not seen while diving, like this slender green fish with yellow stripes. If anyone can identify it, please let me know. 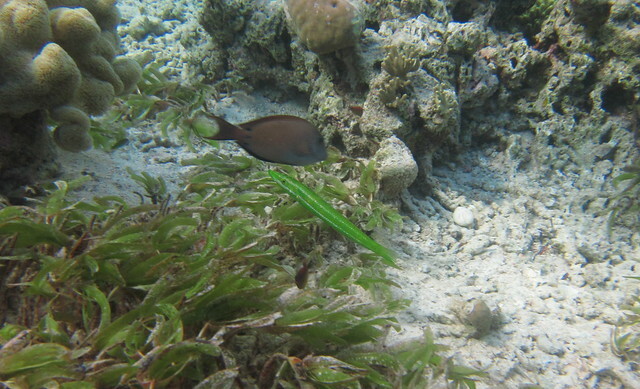 It could be a juvenile, considering that it’s hanging out in the seagrass. 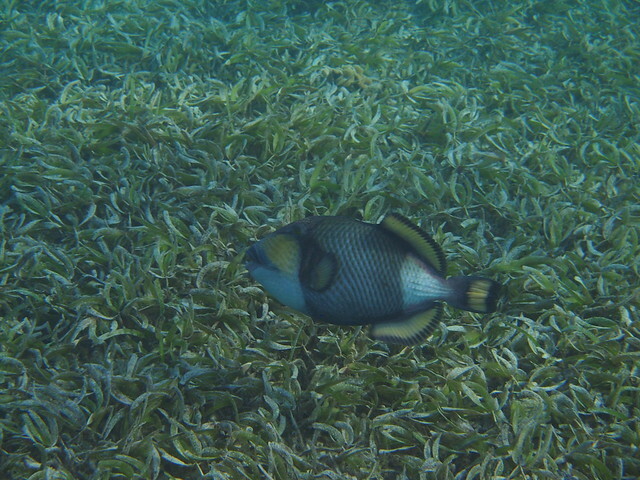 Seagrass areas are well-known to be fish nurseries. 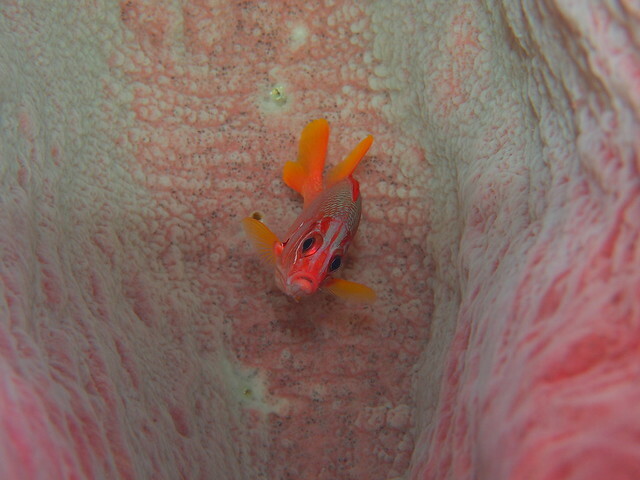 I was very pleased that DC managed to capture a picture of this freckled hawkfish. 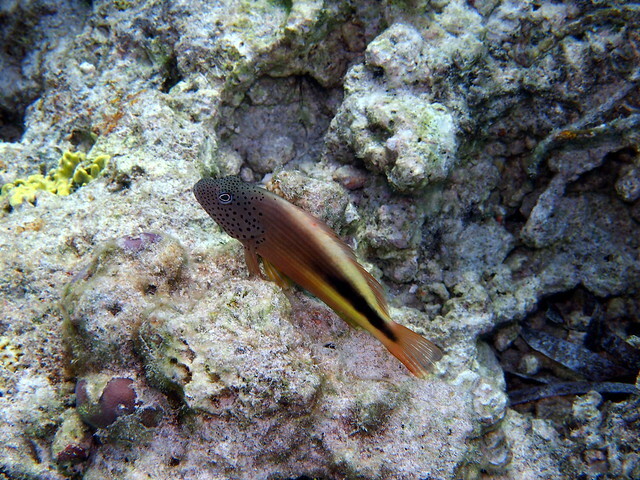 If you follow this blog, you’ll know that hawkfish are one of my favourites. Sadly enough, I didn’t get any good shots of hawkfish while diving and was very pleased to add this to my collection of hawkfish shots. 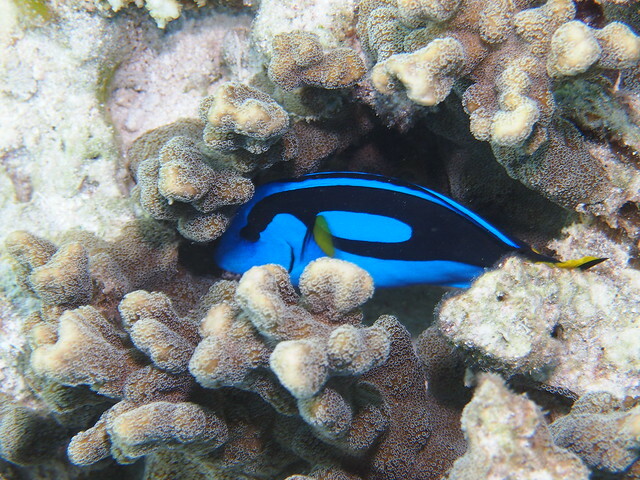 … or this palette surgeonfish. We didn’t do so well either with this spotted boxfish, but at least we can show that there really was a lot of life near the shore. 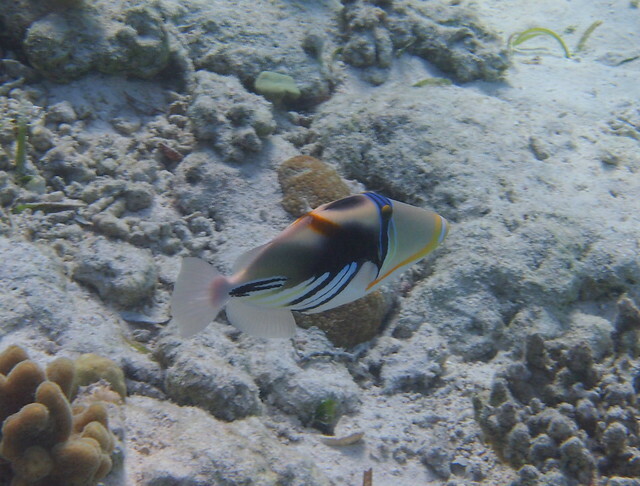 … and a titan triggerfish that we were glad to see swim away. Right by the jetty were plenty of network pipefish that were again a pain to photograph, especially with the surge as the waves hit the jetty. DC was very patient and took enough photos so we got this shot. 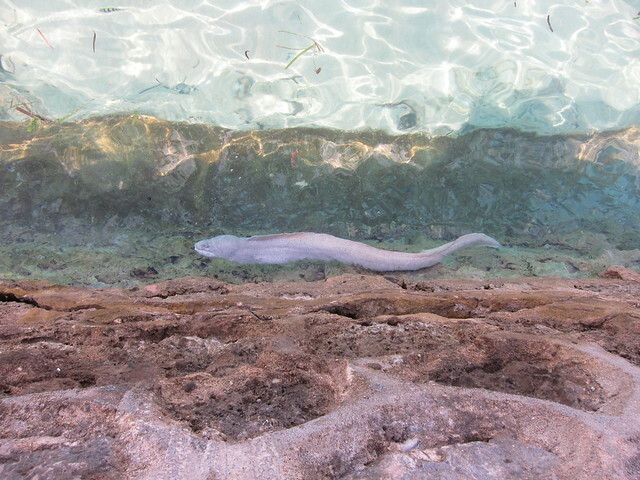 On the jetty itself, we found our good friend the peppered moray. 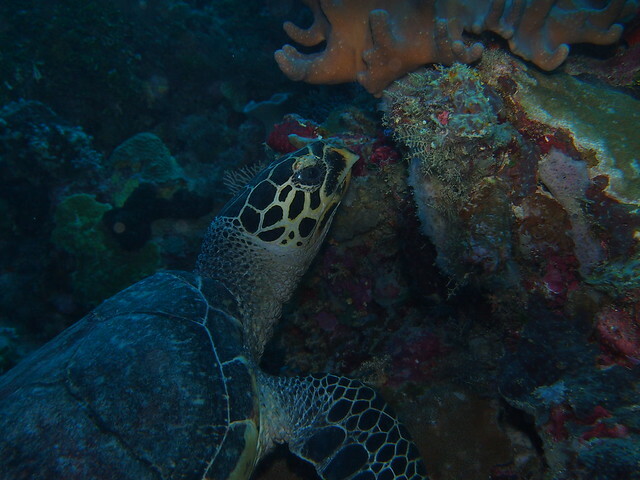 It was lovely to end our two-hour snorkel in the small area by reciprocating a visit! 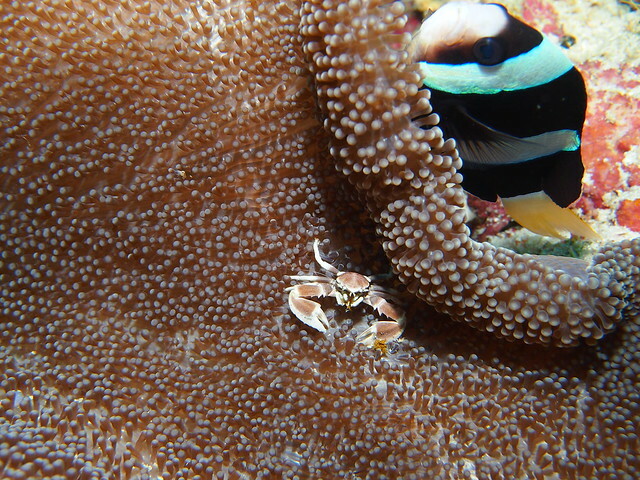 Wakatobi yielded quite a few interesting crustaceans. Sure, we’d seen most of them before, but it’s always nice to say hi to old friends. Let’s start with the lobsters. 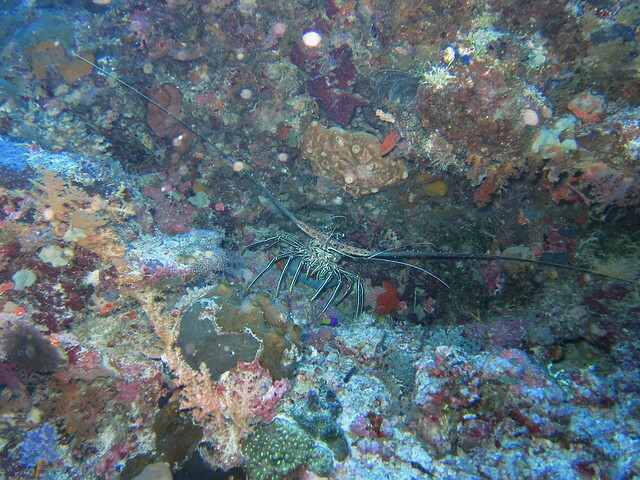 The spiny lobsters with their long feelers are always rather impressive, especially when you suddenly come across one in a crevice at eye level. Sometimes they can be quite shy and it’s hard to resist the temptation of reaching out and pulling it it out of its hole by the feelers! In case you’re wondering, yes we all managed not to cave in. 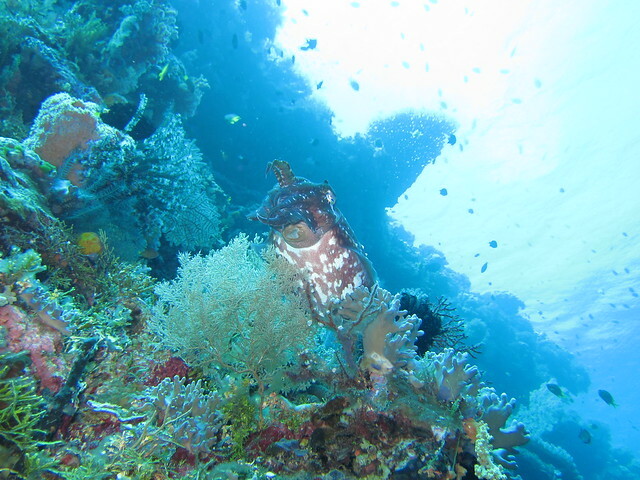 After all, Wakatobi is famous for being a no contact dive centre. 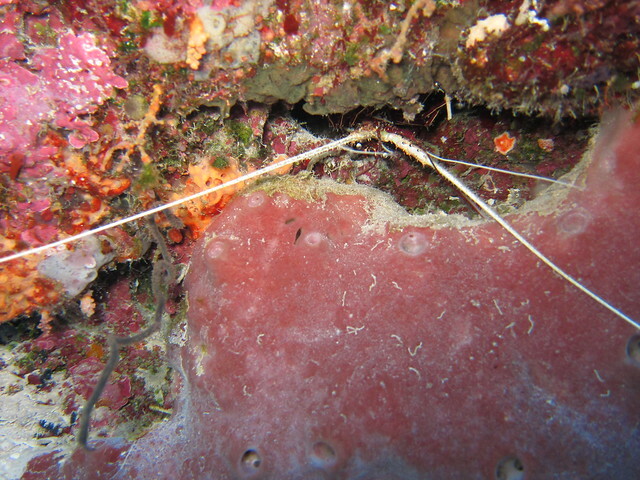 Do not touch is a central part of their dive philosophy. 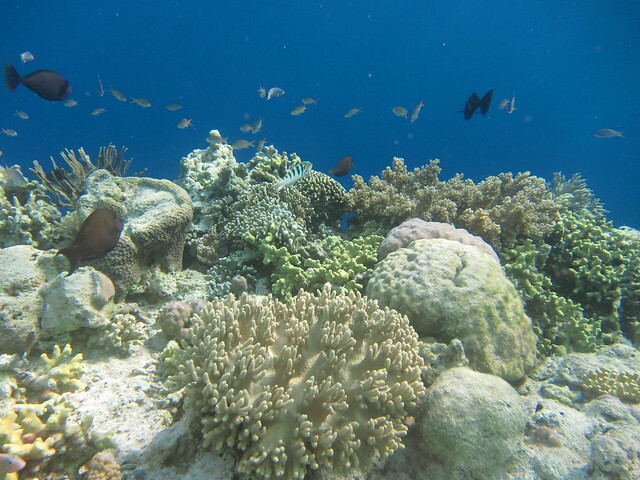 This is one of the reasons why the reef is so pristine! 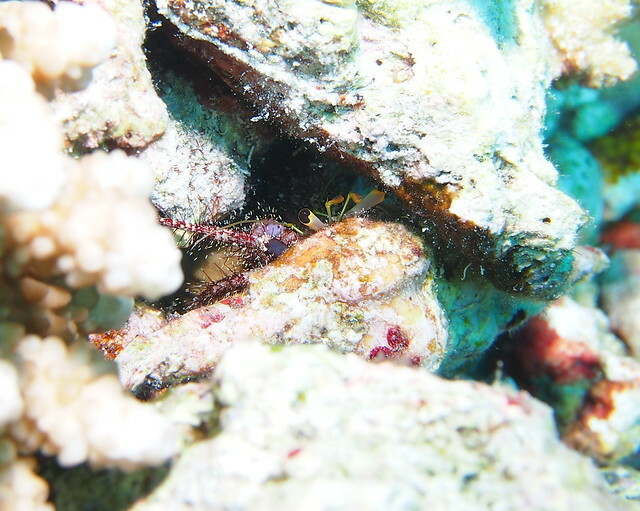 We also saw a bunch of crabs, like this shy hermit crab. There were also some porcelain crabs, but most were very shy. This is the best photo of such a crab in this trip. 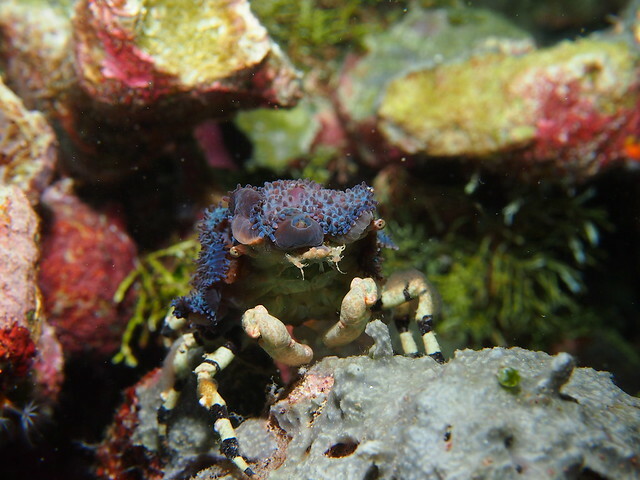 Sure, there would have been better photos if our guide Yono had used his pointer to push out the crab from under the anemone when it went into hiding. 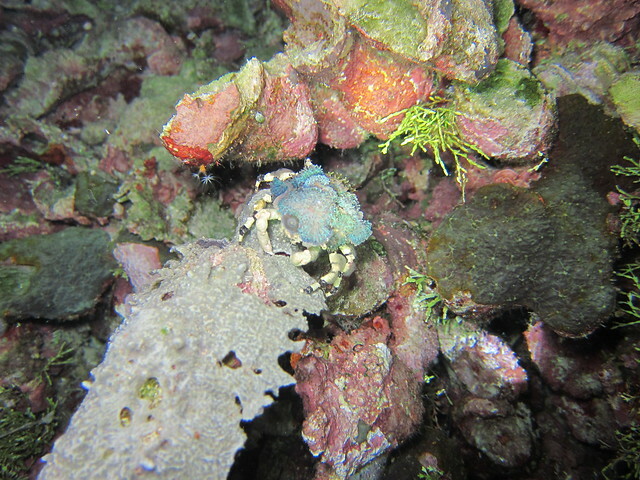 In fact, one dive I found myself staring at the empty anemone top, wondering why Yono wasn’t doing exactly that. Then I caught myself and realised again that keeping a pristine reef also means that you don’t disturb the animals from their normal habits. You just need the patience and the opportunity to get a good photo. Which is exactly what happened with this orang utan crab below. It looks like a piece of red lint at first, but look carefully and you can first make out its eye stalks and then its fragile-looking limbs, all covered by what looks like fluffy red fur. 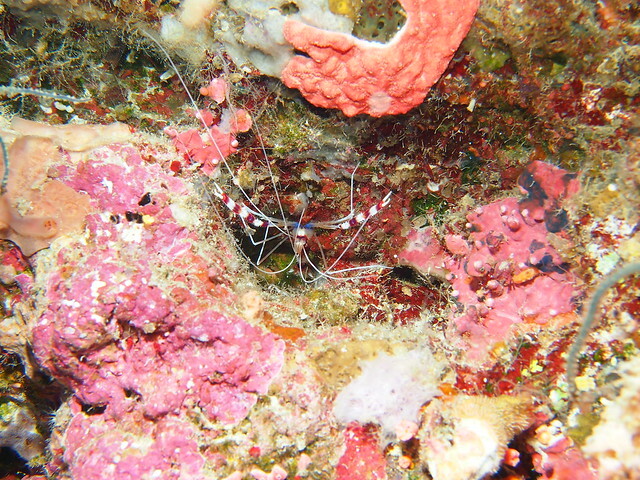 We were also lucky to see a collector crab on a night dive. 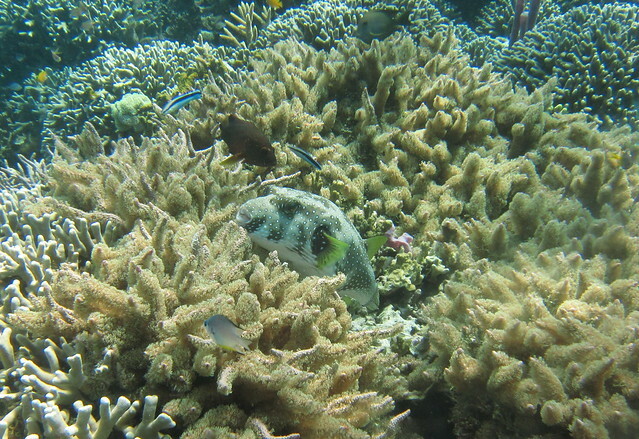 It had pretty white and dark blue banded legs, and a rather fetching mantle of small anemones on its back. 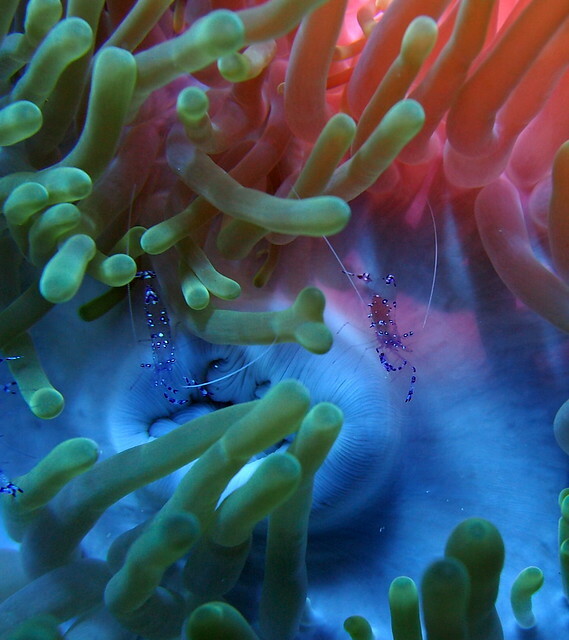 You see, it gets its name from the way it picks up charming-looking anemones and sticks it on as camouflage. DC managed to get a very impressive close up. 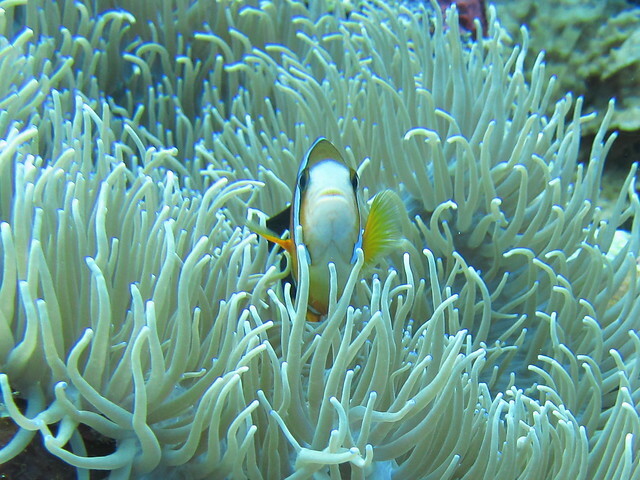 The anemone flaps over its forehead, making it look as if it’s frowning. Next up is another DC masterpiece. 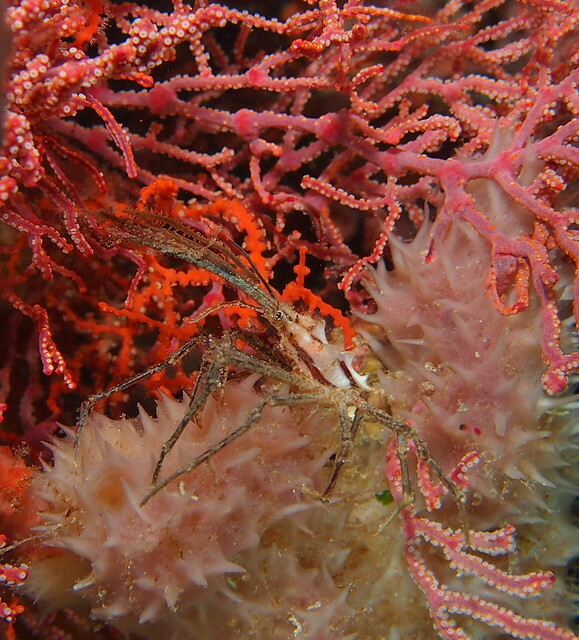 It’s a spider crab, which is typically rather hard to spot and also hard to photograph, because the camera has difficulty auto-focussing with all the spindly legs in the way. And then the shrimp. 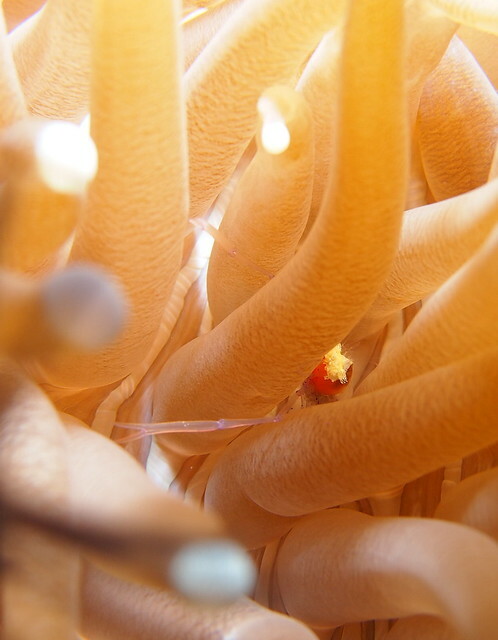 One of my favourites are the commensal anemone shrimp. I love wagging my fingers at them in the hope of enticing them onto my nails for a good manicure. Unfortunately, none of them were keen enough this time. 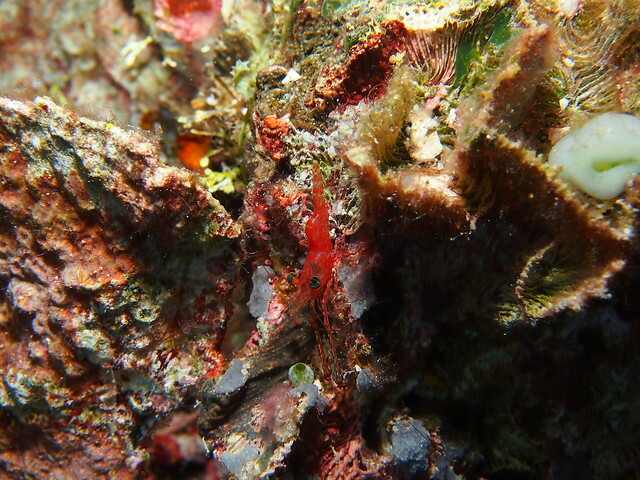 There were plenty of banded boxer shrimp in crevices, their trademark red and white colouration on their claws. It’s the same colouration of a barber’s pole and advertises a similar service. The shrimp offers a clean while a barber, a shave. It’s funny how there are these parallels in natural and human worlds. 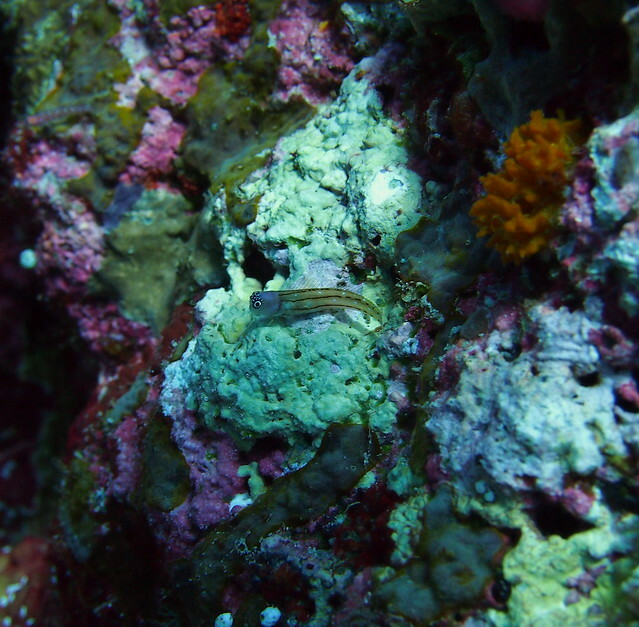 I was very happy to see some saron shrimp as they’re hard to come by. This one is a very red specimen without much marbling that a lot of its cousins seem to have. This pose somehow makes it look very poised, as if it knows that the camera is snapping away! 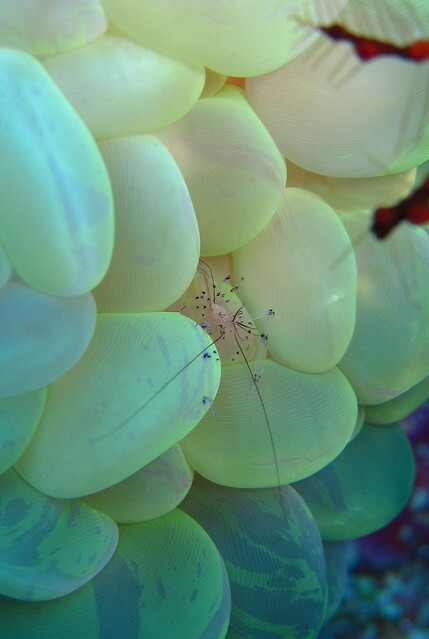 One of the most frustrating crustaceans to shoot is the bubble shrimp. The two photos below are our best shots. There’s something about its frail tendrils and the voluptuousness of the bubble coral that really interferes with the camera’s focus. This is one of those you have to go diving to look at more closely. 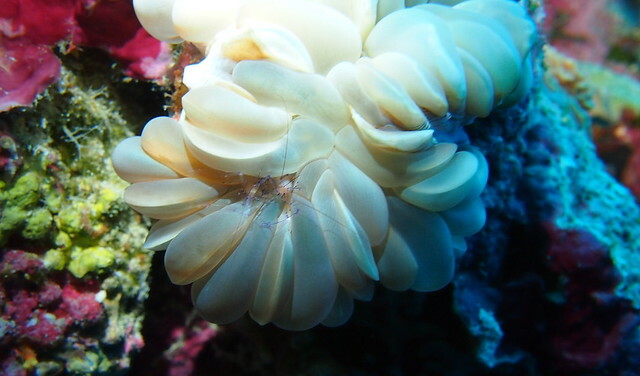 It’s so amazing to simply observe how a delicate shrimp can wodge itself in the bubble coral. 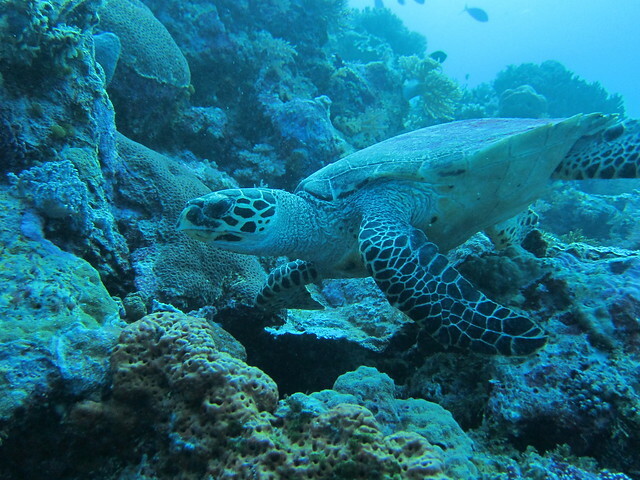 We saw quite a few turtles at Wakatobi, all green turtles. 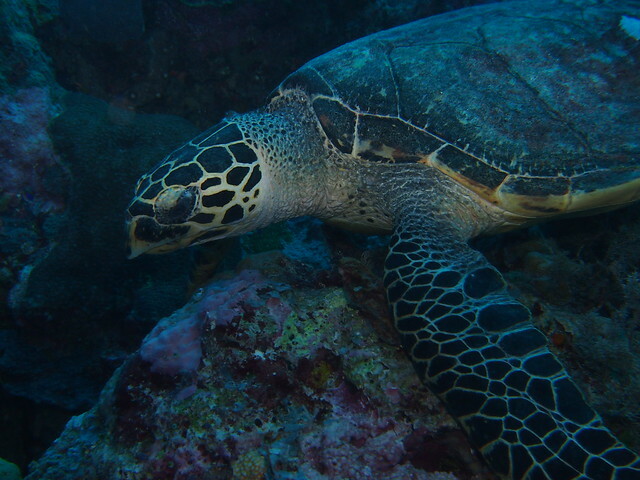 Green turtles are apparently named for their green fat rather than being green on the outside. 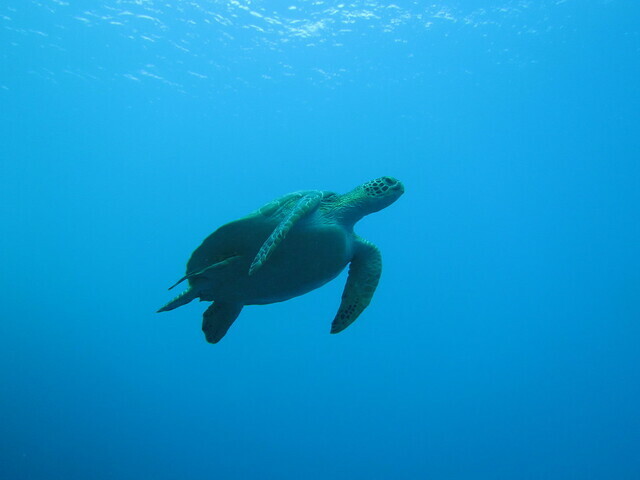 Historically, they’d been hunted by sailors for fresh meat, but thankfully people don’t eat turtle that much these days. The turtles we came across were rather friendly, in that they didn’t mind us being around at all, even though we got in pretty close. Sure, this one didn’t really do the eye contact on first meeting thing, but it’s good enough for me! And after a while, we got over our excitement and left that turtle. 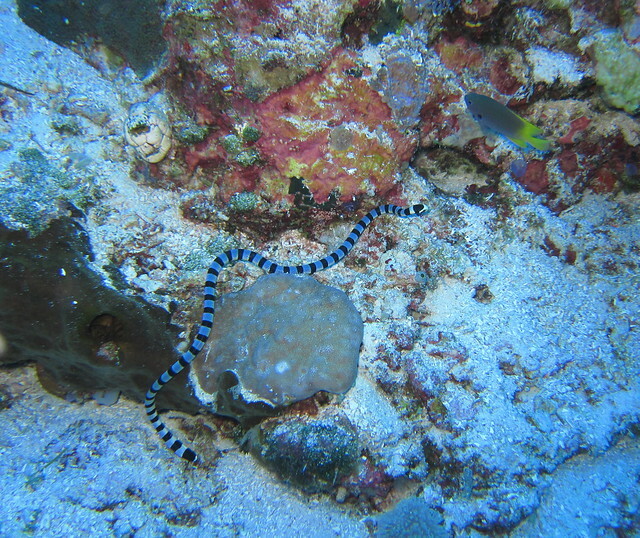 We delighted in others just passing by, like this one cruising along in the blue watching the coral wall go past. 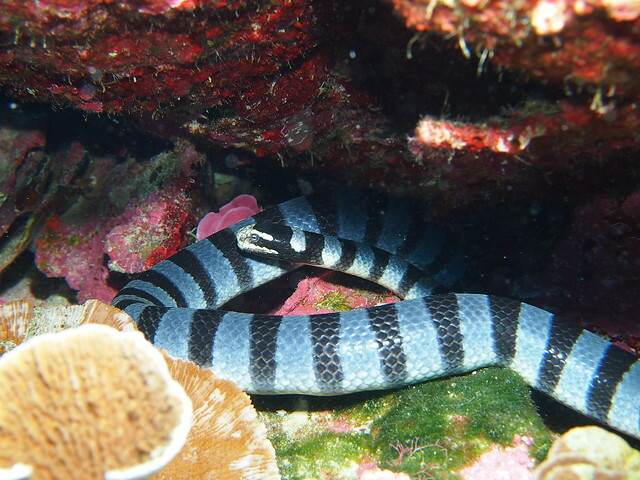 A less friendly reptile was the banded sea snake. DC managed to get in nice and close to this one in a crevice. He’s so brave, I wouldn’t have the nerve! Check out its beautiful black and grey-blue scales. It’s a very shy creature and doesn’t stick around much. I only managed a hasty shot that shows off its rounded head and rudder-like tail. 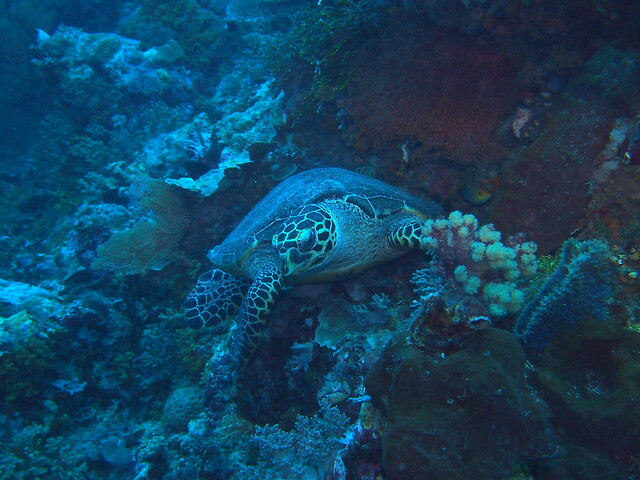 And off it went, not to be seen on the same dive again, while yet another green turtle looked on curiously. One of DC’s favourites is the seal face pufferfish. It’s got such a nonchalant expression with its pouty black lips, but isn’t easy to photograph. These puffers shy easily and don’t like divers coming too close. No wonder DC’s so pleased with this side portrait. 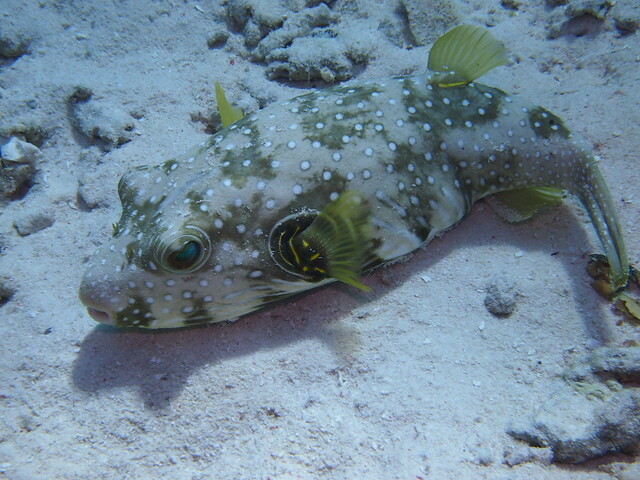 The white-spotted puffer was more common at Wakatobi. 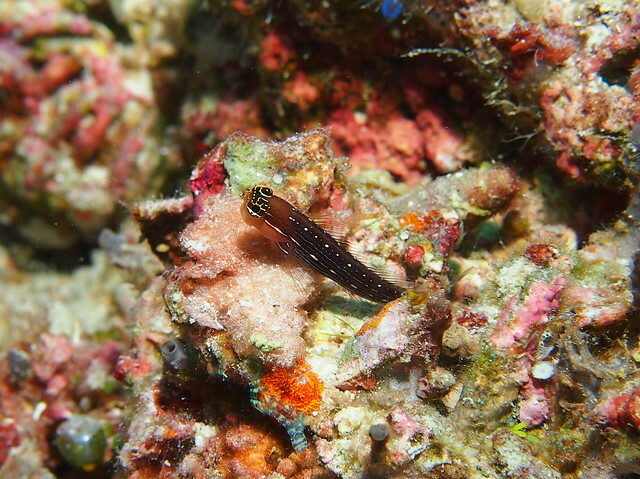 It was mostly found hanging out near the coral, often getting a good clean from the blue-streaked cleaner wrasses. See how its mouth is open in seeming content while being tended to by the little fish. It was much easier to approach when being cleaned. There’s an etiquette at cleaning stations that no one eats anyone else, so each fish gets its turn to be clean and is less wary than normal. A great rule! Sometimes the puffers seemed to be asleep as they lay on the sand. Even though we got really close, this one didn’t seem to be bothered at all. Same for this large star puffer. It seemed to be sound asleep (fish don’t have eyelids) with its mouth agape. DC managed to land gently on the sand and kneel in front of it to get this shot. 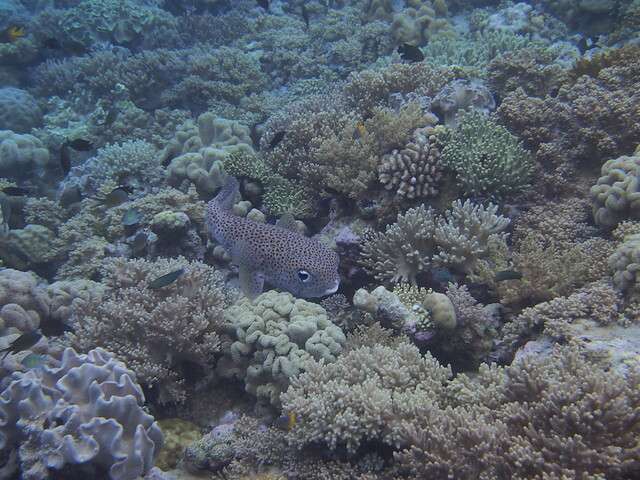 Again not so common was the porcupinefish. Its distinctive head shape is super cute. There’s something about the large eyes and rotating fins that I get a kick out of watching it make its languid way over the coral. … but not before capturing a few close-ups. 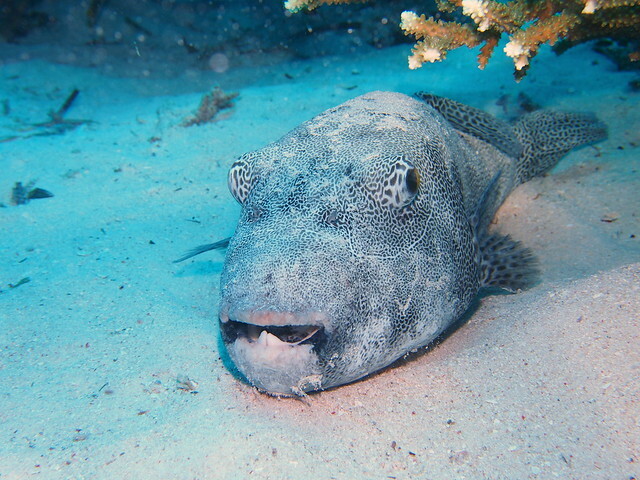 See how the bumphead’s forehead and mouth area are slightly scuffed. This is from banging into the coral and then nibbling off bits. 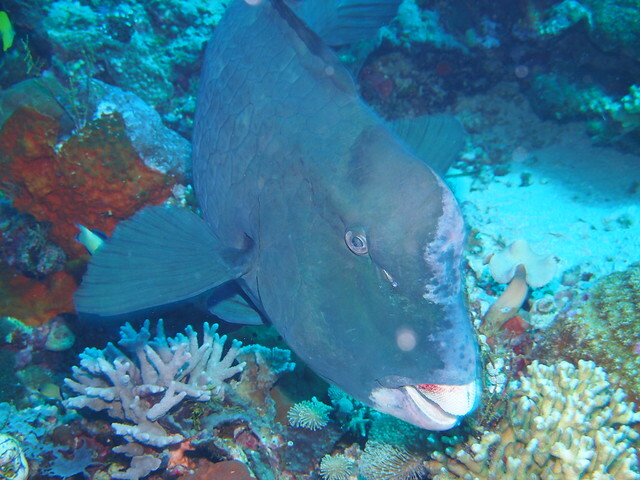 You’d typically expect a herd of bumpheads to turn up if the water suddenly becomes cloudy from the sheer amount of coral chomping the buffalo of the sea do. 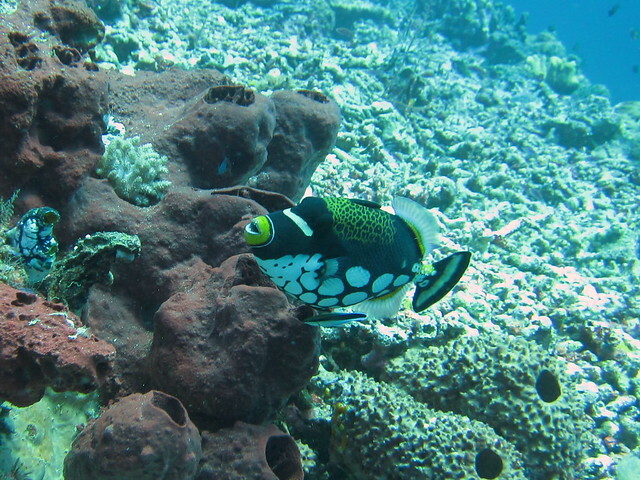 My favourite odd-shaped swimmer is the clown triggerfish. I can’t tire of admiring its wonderfully whimsical patterns, from the large white dots on its belly to the yellow lipstick with extra white outline round the mouth to the yellow fan detail on its dark blue tail. 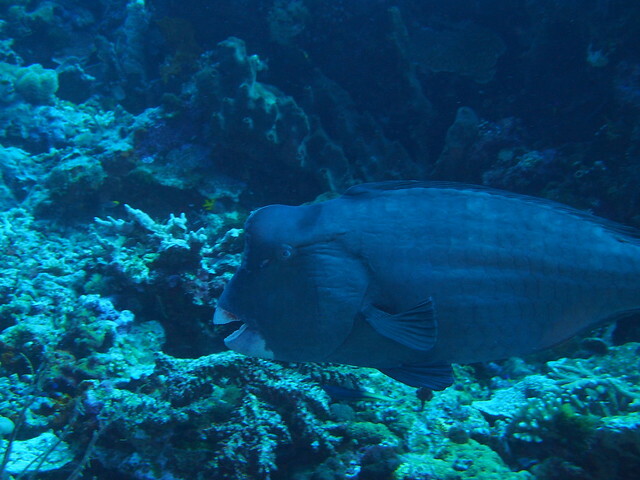 The only thing that could be vaguely scary about the clown triggerfish (its cousin is the often highly aggressive titan triggerfish that clever divers normally stay clear of) could be its teeth. But here, all it’s doing is keeping its mouth open partly as invitation for a dental check, partly as signal that it’s in “please tidy the room” mode. Last and littlest in this series is the black-saddled toby. It’s a little fish that darts around quite a bit and I’m glad that this photo of one furtively trying to get away is composed so dramatically! Most dives at Wakatobi were wall dives, with us drifting along watching the coral like TV just on one side, our backs to the blue. Sometimes we’d miss some sights out in the blue, like a few stern-faced tuna cruising past. 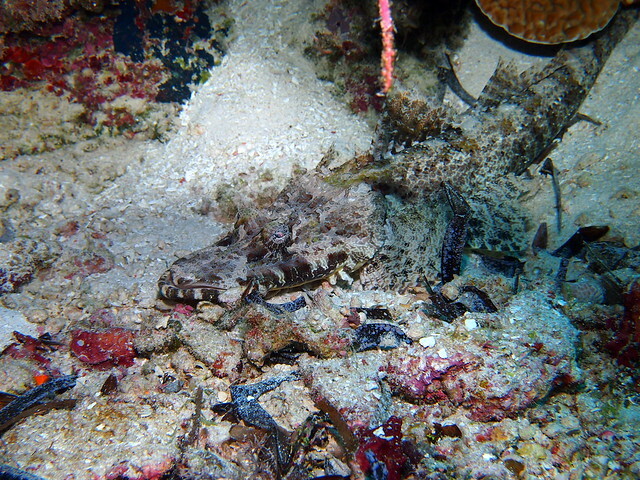 But most of the interesting things were unsurprisingly in or on the coral wall, like this crocodile fish in a shallow sandy alcove. Look carefully for its eye towards the centre of the picture and you can see it materialise. It’s even harder to spot with the naked eye, because the dark mottling only shows up when filled in with the white light from the camera flash. 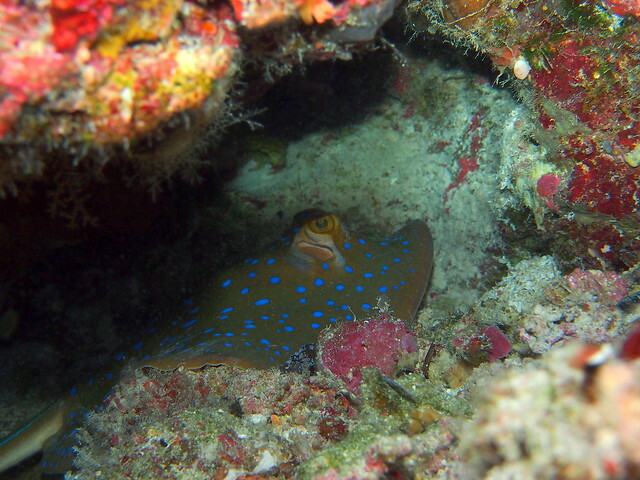 Another fish that favours grounded in coral alcoves is the blue spotted stingray. 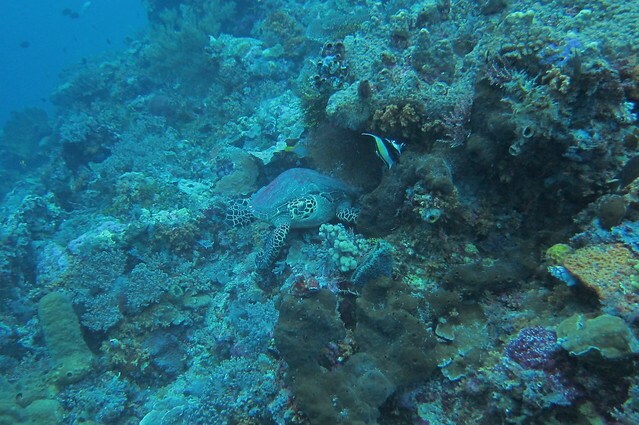 It was a bit of a rare find at Wakatobi, and very shy. I like how electric the blue of its spots are! 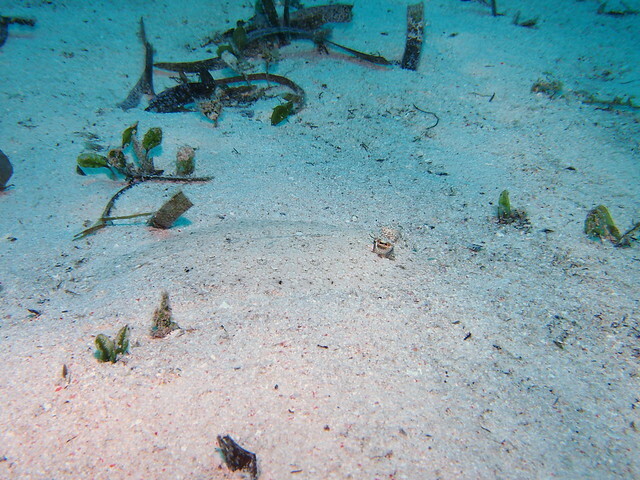 There was one dive site in particular that broke away from the usual wall dives, letting us explore the sandy bottom. 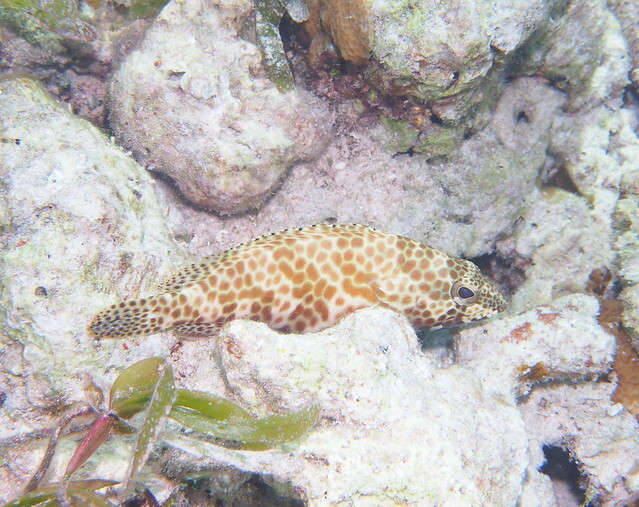 We saw a few leopard flounders with markings so matching to the sand beneath it that I’m sure there were plenty more than we could easily spot. Look for the eyes slightly right of centre if you can’t make it out. 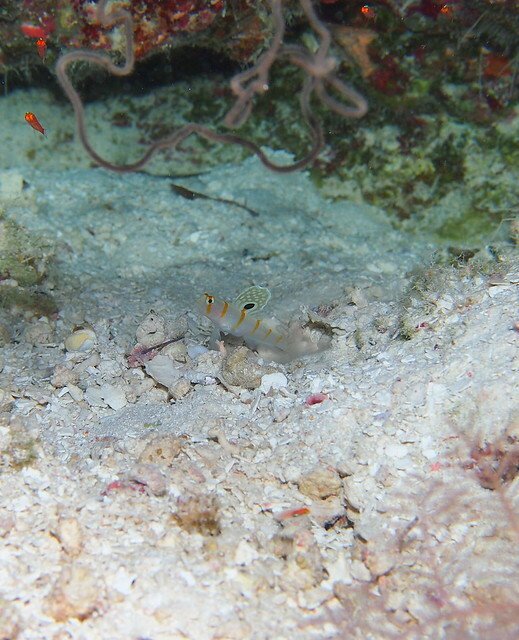 One of my favourite underwater pairings to look out for are the shrimp and its goby. 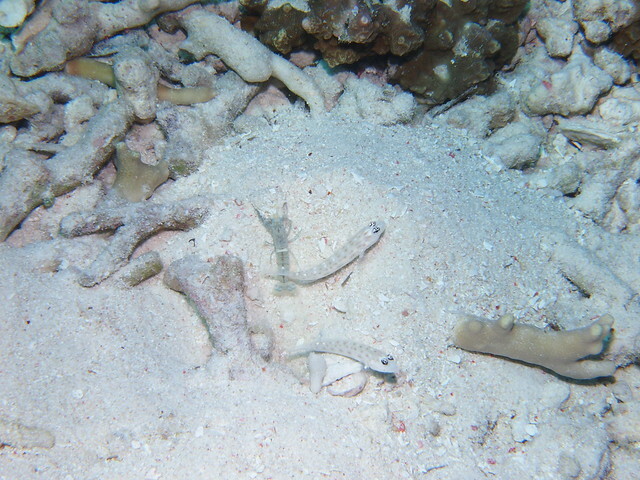 In this case, the blind shrimp keeps house for two sand shrimpgobies. It must be busier than normal! 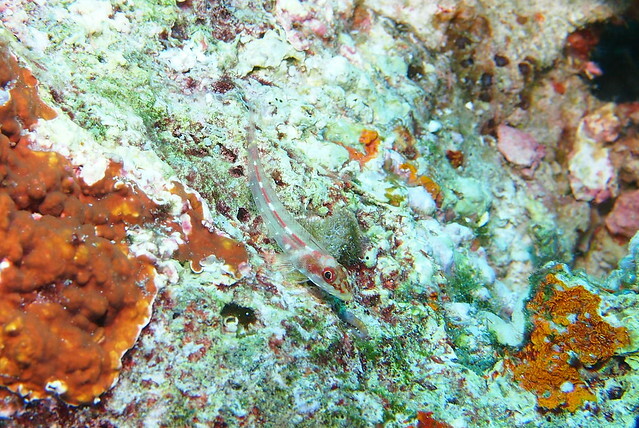 And here’s a Randall’s shrimpgoby that is on guard. It’s already alerted its shrimp, which is snugly hiding in the burrow. 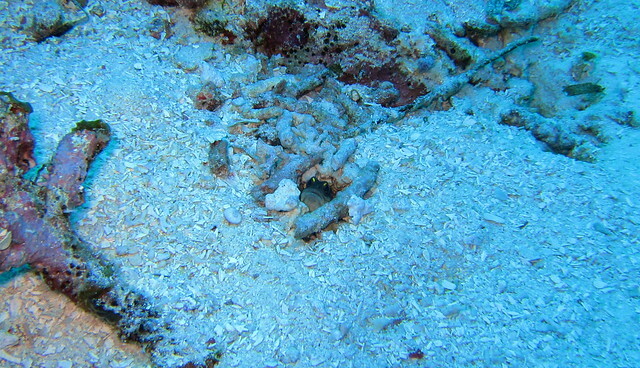 One of the rarest of the bottom dwellers is the sea moth, a strange fish that doesn’t swim. 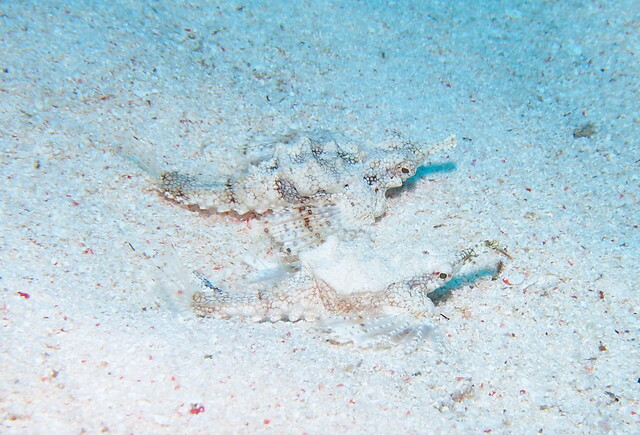 It crawls along the sandy bottom using its fins and tail instead. This bizarre creature comes alone or in pairs. 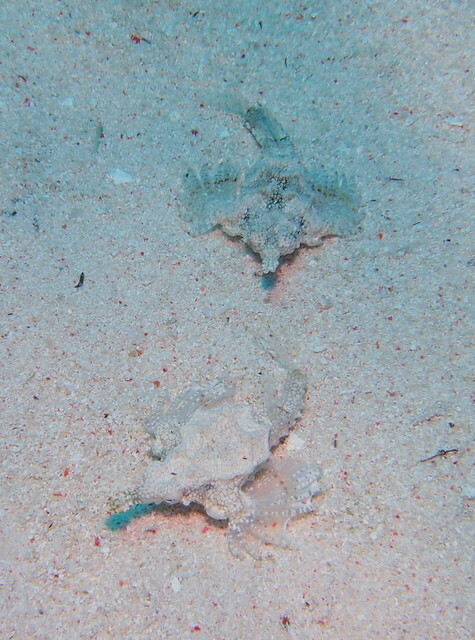 We spent a while stalking this pair across the sandy bottom, trying not to disturb them or the sand under our fins as we made our shots. 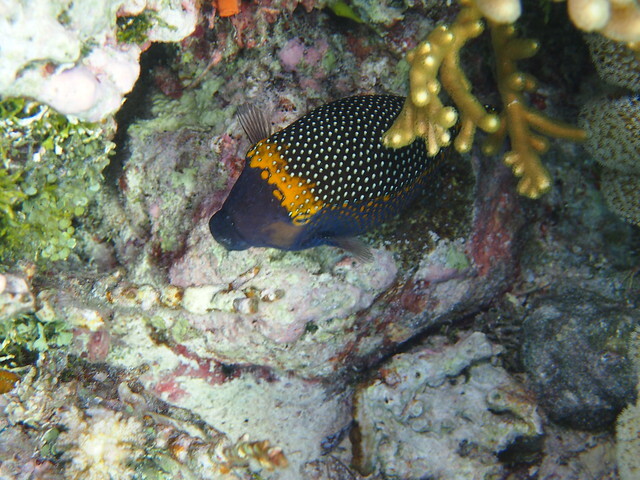 More stationary is the yellowbarred jawfish peeking out from in its hole in sandy coral rubble. 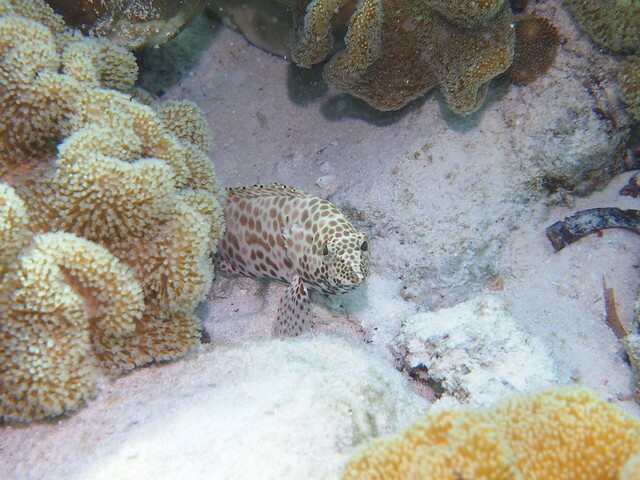 I’m told that the jawfish is one of those where the male holds eggs in its mouth till they hatch. The mechanics of how this happens boggles my mind. Sad to say, this one didn’t have eggs in its mouth. 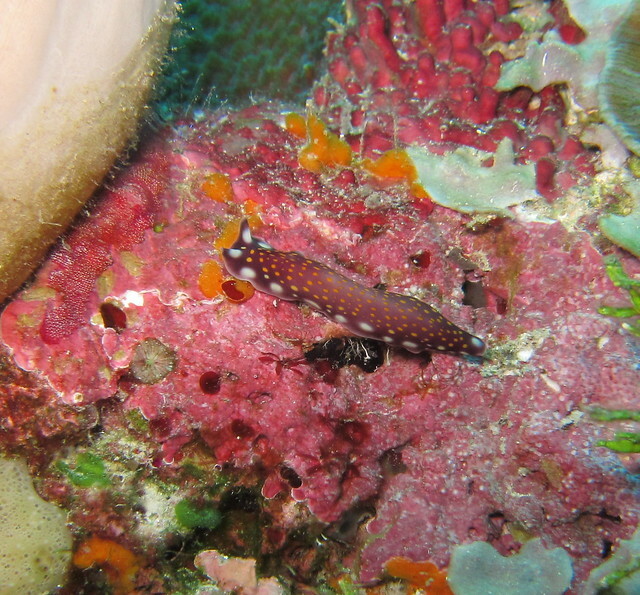 Not quite bottom dwellers but making it to this post because they’re always found perched on the coral are the blennies. These are the ones with heads that look vaguely like Homer Simpson, like a strange mermaid edition. The odd bulbous eyes never fail to fascinate me. It’s a pity they’re generally very shy and dart away so quickly it’s hard to get a decent picture. 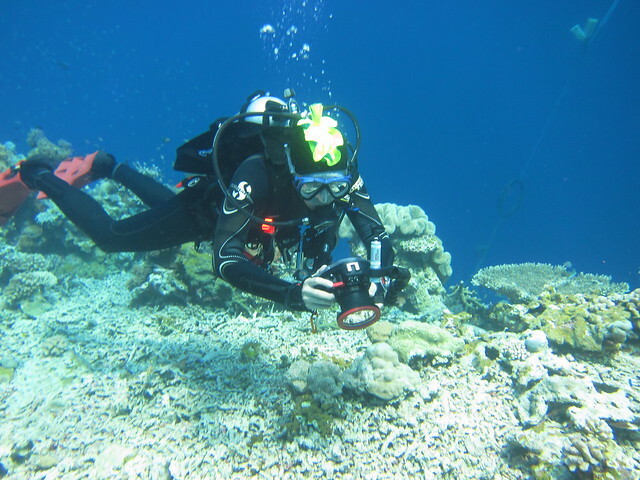 We see so many out there while diving, but rarely have a good shot. 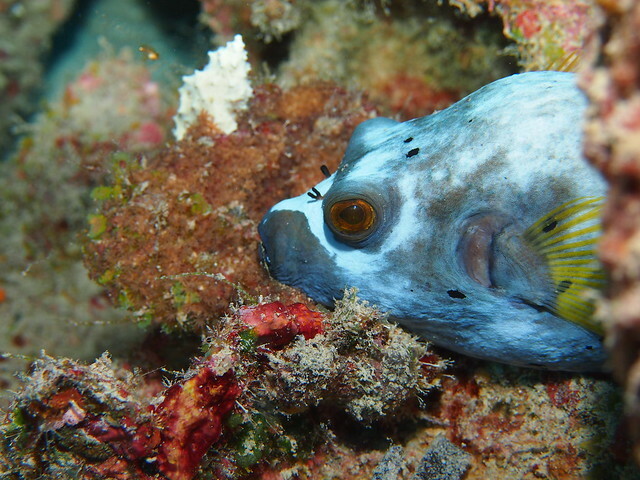 Similar in size but with a more elongated head (and therefore looking more like an archetypal fish) is the triplefin. 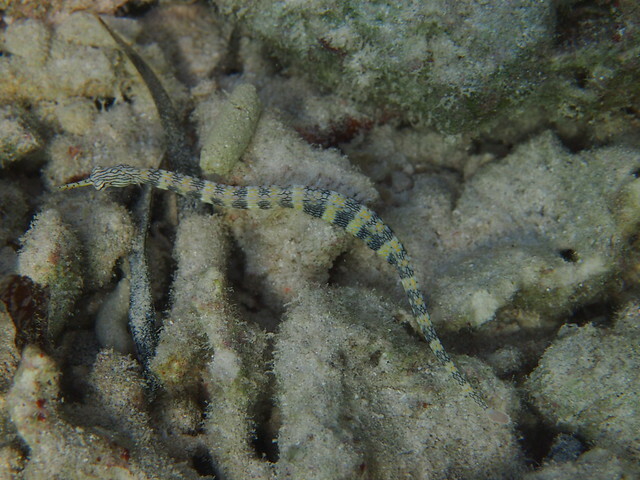 I think this is a pale-spotted triplefin, but please correct me if it isn’t. 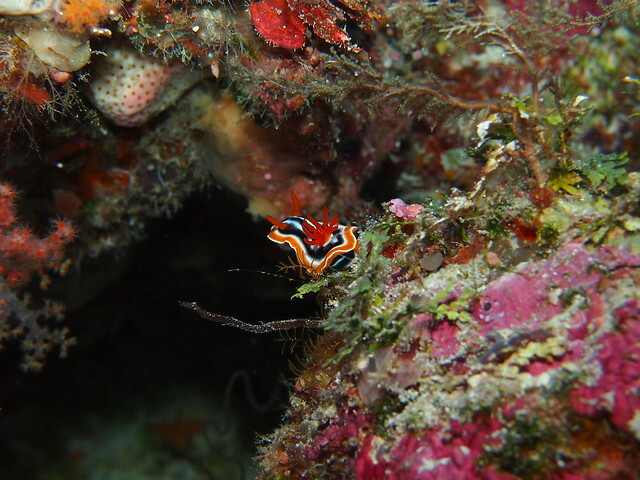 It’s got a very translucent body and red and white markings that makes it blend in very well with the coral beneath. 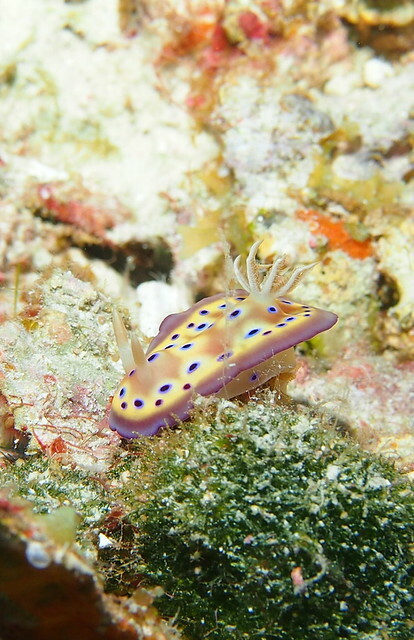 Nudibranchs are a photographers’ dream. For one, they come in so many different colours. Two, and more crucially, they are fairly stationary and do not shy from the camera. They are fantastic subjects for practising underwater photography on, such as this chromodoris (possibly a chromodoris willani). 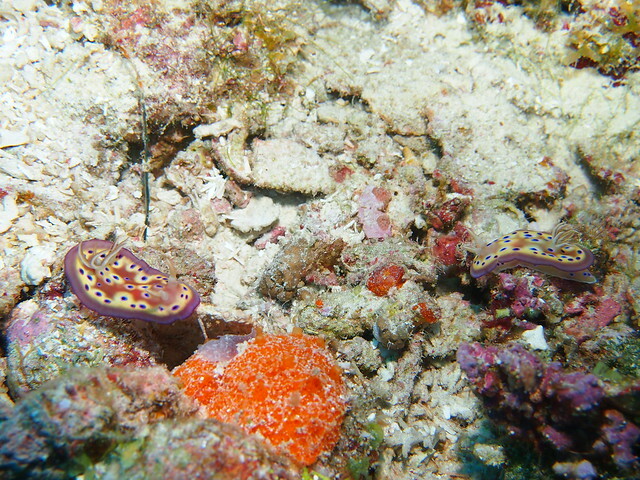 More colourful is the chromodoris magnifica. It looks as if it’s been invented by a kid drawing with a marker pen, with its bold colours and simple design. It also makes for stunning portraits, like this slightly pensive one. 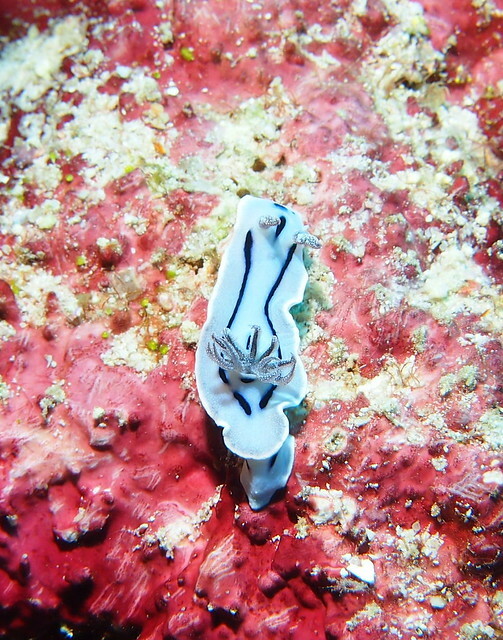 Making equally pensive photos is the chromodoris kuniei in solo. In a pair, though, they lose the pensiveness and from further away are surprisingly hard to spot with deep blue flecks on yellow and purple backgrounds. 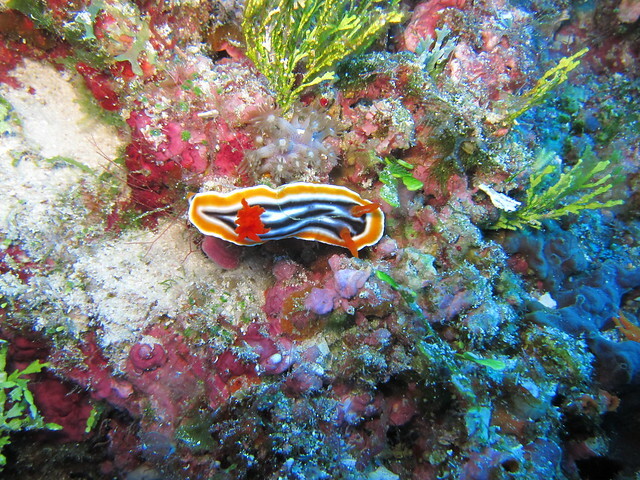 This last nudibranch I can’t seem to identify. Please tell me if you know. I like this photo a lot: it came out quite well even though the fella was in an awkward position in the shade. Naturally, I didn’t get a good shot and DC got a great one. His flash lit it up just enough to show the details and to keep some parts in slightly mysterious blur. 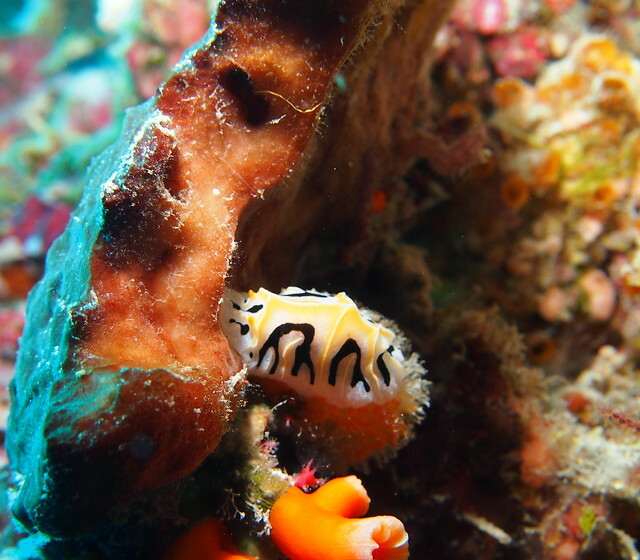 This last specimen I think doesn’t belong to the nudibranch, or sea slug, family. Apparently it’s some kind of worm. Again, please say if you know what it is. Last, but definitely not least is my very favourite sea slug that sits atop DC’s head while diving. The cutest thing about it is that the gills of the nudibranch (the bit towards the back looking like a brush head) expel bubbles! It’s definitely not true to the original because I’d never seen a bubbling nudibranch before DC started wearing one on his head! Wakatobi is a great place for macro shots. 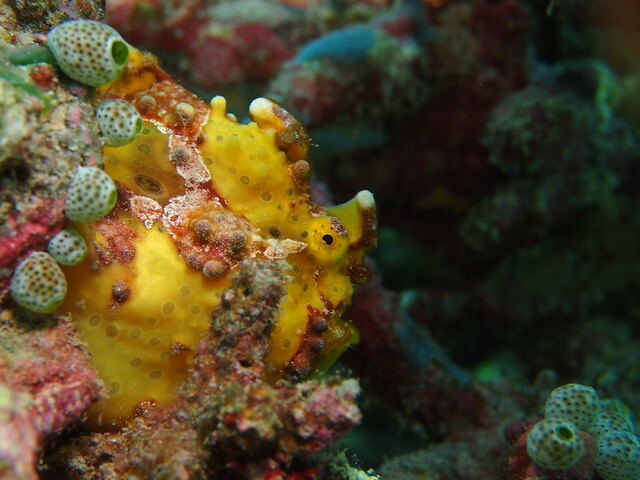 If you have a good camera like DC, you could get right in on some of the creatures, including this warty frogfish. It looks uncannily like a bright yellow plastic toy covered in coral muck. 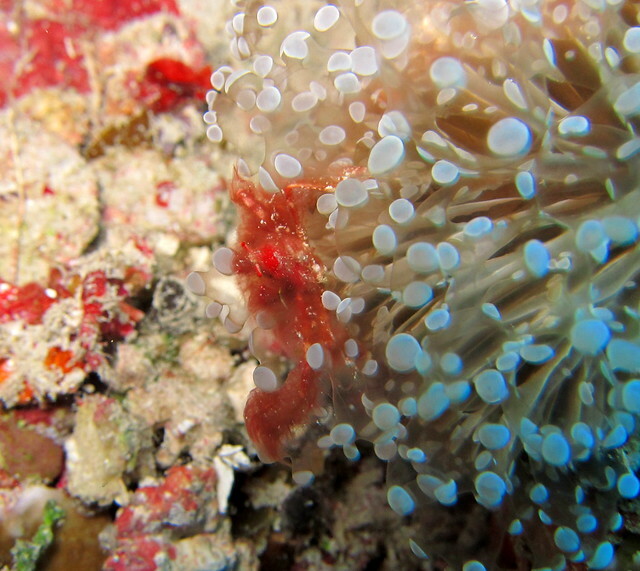 It’s of course quite easy to get in close when it’s soft coral. Aside from the fact that it doesn’t run away, I like how the textures really show up when you go in closer. Check it out. With coral, sometimes you don’t have to go in too close. 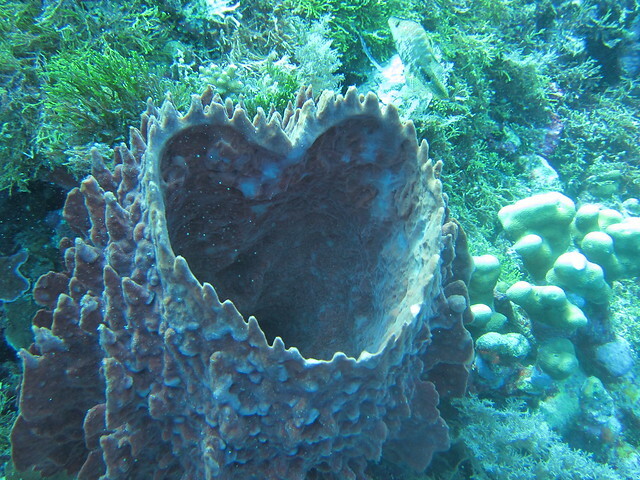 DC pointed out this barrel sponge which is typically round but this one was heart-shaped! How sweet! Other ways of getting in close include catching a fish unaware, like how DC did with this poor fella in a barrel sponge. It must’ve been so relieved to get away once he was done with the shot! 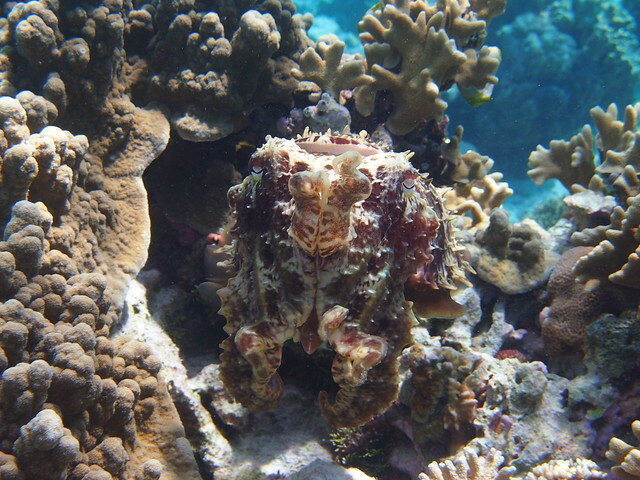 Another way is to try getting in under the creature, like with this reef cuttlefish. It looks quite different from the bottom, with its blowhole clearly showing. Otherwise, just tackle it head on. The cuttlefish will definitely start its aggressive display, which is quite interesting to watch as it changes its colour and pattern, and lifts its tentacles threateningly like so. 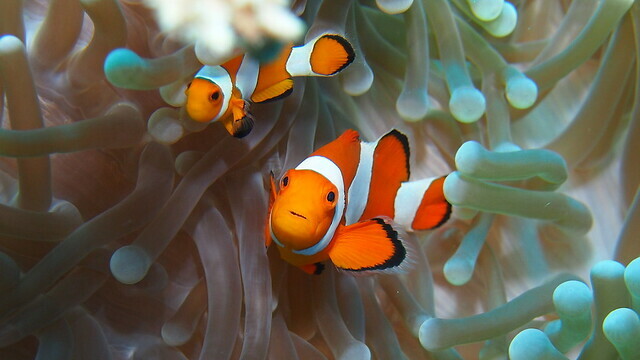 … while this clown anemonefish merely looks up in mock surprise, his smaller counterpart taking confidence in the protection of the anemone.